Time certainly has flown in the past four weeks. Think about this: The final week of Blogging for a Cure begins today. 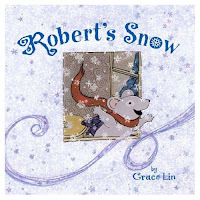 Once again, I would like to thank Jules and Eisha, the fine ladies of 7-Imp for spearheading this effort to promote Robert’s Snow: for Cancer’s Cure, a series of online auctions that will raise money for the Dana-Farber Cancer Institute and cancer research. Please visit the Robert’s Snow website to learn more about this unique fundraiser, which was co-founded by Grace Lin and her late husband Robert Mercer. 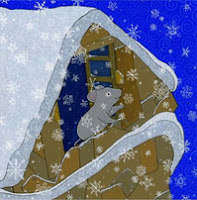 Jules coordinated the efforts of dozens of bloggers who have been posting features about the picture book illustrators who created snowflakes for Robert’s Snow 2007. She also organized the master schedule for our postings. In addition, I would like to thank Tricia Stohr-Hunt of The Miss Rumphius Effect and Jen Robinson of Jen Robinson’s Book Page for providing participating bloggers with weekly schedules to post at our blogs. These are the Robert’s Snow artists who will be/have been featured at Wild Rose Reader. Keep up the good work. I can't wait to read your last two entries. P.S. - This link should also be month 11, not 10. That should fix it! Thanks so much for alerting me to the error. I had corrected it earlier--but sometimes Blogger doesn't save the changes! No problem. I'm dropping in to encourage you to come renga with me this week! I'm hoping all my favorite poets in the kidlit world will come help build a poem.